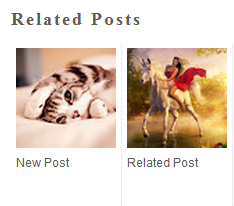 Now here is a wonderful hack for displaying related posts beneath each of your blog posts, along with thumbnails. The related articles are chosen from other posts in that same category/label/tag. With this hack many of your readers will remain on your site for longer periods of time when they see related posts of interest. - for displaying more than 5 posts, replace 5 value from "var maxresults=5;"
- change the 6 value from max-results=6 with the number of posts you want to be displayed. - If you want the related posts to be displayed on homepage too, remove the code in violet.